I was going through some old papers today, and came across a poem Lindsey wrote. I think it was from middle school, so around 10 years ago but it is so beautiful, and so reflects her, I wanted to post it and share. She is such a wonderful human being. I am very proud. I am a flower child who loves dolphins. I wonder why there is so much hate in the world. I hear a pounding sound when all is quiet. I see a pot of gold at the end of a rainbow. I want a chance to swim with dolphins. I pretend to be a famous dancer on a giant stage. I feel tempted by peer pressure. I touch the air, the stars, the moon, and the peace that is deep down in everyone’s soul. I worry about the ozone layer. I cry for my grandma Rita in heaven. I understand life is not easy. I say love rules over evil always. I dream of the day when homeless people are off the streets. I hope to make a difference. This is us a couple of years ago. Just an update. Shoot I am really failing at blogging, I can't believe it's been over a week again. I went to two Swell Sister meetings last week, very exciting stuff happening. We have an art show scheduled for December for Second Saturday. Second Saturday is a regular art event here in Sacramento. For more info go to http://www.2nd-sat.com/ This will be my very first art show, I am so jazzed about it. We are meeting to plan the evening, writing our bios, getting press releases together, planning the reception, and oh yeah thinking about what to paint… well I am thinking about painting cause that is what I do. Other sisters have other art that they will show. It is all exciting. Our show will be at the Coffee Garden http://www.thecoffeegardenonline.com/ a local coffee house. It's a little off the beaten path for Second Saturday, but there is another gallery next to it and they have been doing a Second Saturday event for a while so we have high hopes! Our theme for the show is 'Gather the Women'. I am still contemplating what my subject might be!! I am also involved in the current Swell Sisters Indi project. There are 9 of us, (I think 9 maybe 10), each of us started a painting or piece of art. Then we passed off what we did to another sister to work on. I am posting both my piece I started and the piece I worked on second. But remember these are both UNFINISHED works in progress! The piece with the drummer, there was only the background when I got it to work on. But in that background I saw him! Whala!! He has a creepy unfinished face, his lips are not right, and underdeveloped hands, I had to force myself to stop working on him cause he bugs me unfinished and he's just staring at me through those dark glasses! Smirking at me... but I get to pass him off Friday so I'll be ok! :) The girl, I started her, put her down and then worked on her again because I found out I had longer that I thought. First it was just the background and her, no head or arms. Then I added the mirror, with the reflection with a head and messy hair and the light. I see it as a self image kind of thing. It will be interesting to see what the other sisters do with it! Oh and more painting at home. We are now working on Lindsey's old room, our soon to be new office. Her room was dark blue ceilings, bright green walls and had hot pink trim. We decided to just paint the trim, we could live with the blue and green. So I bought a gallon of paint, well last week Joe accidentally dropped the paint can. Yep. Paint all over the carpet. Yikes!! But we worked quickly, scooped up what paint we could, shop vac'd out the excess we couldn't scoop up then I steam cleaned over and over and over again. Really the paint doesn't even show on the carpet, so that was good. BUT… now that we are almost done, guess what, we have about a half of a quart too little paint. Just about what we lost. So I guess it's off to Lowes again we go! Once it's painted we can move the office, then next, MY ART STUDIO!!!!!! And last a Chester update. He made it through the surgery great! He had to wear a cone on his head for 2 weeks, until the staples were out. That cone was a pain, he kept just plowing through things, running into walls, I thought he was going to break his neck and he almost knocked me down more than once. But it's all good now and he's back to his sweet loving self!!! 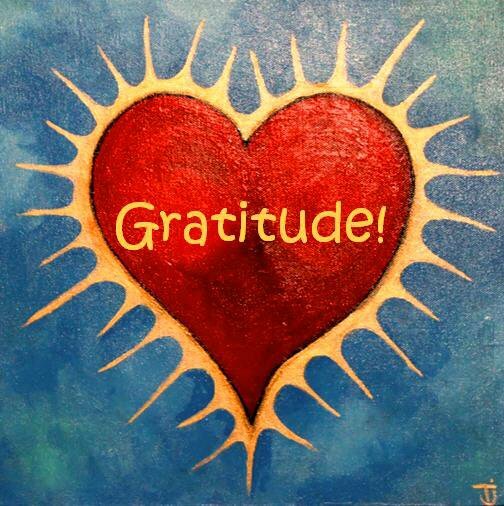 That's all for now, be well! Tj. Happy Monday... back to work! Ok, I have been neglectant. I've been back from vacation for over a week and still haven't written about it. Time gets filled up so quickly. Ok, Vacation… we rented a house in La Selva Beach, which is about 10 miles south of Santa Cruz. The house had a wonderful ocean view, and a partial beach view (there was a parking lot for the beach that blocked some of the view). Sitting on the deck you could watch surfers and dolphins in the waves. See the kids at day camp for Junior Lifeguards running and doing their exercises. The beach was wonderful and went on and on… The house had a rail road that went right by it, that added an element that was fun! The train went by twice a day, just during the week and the conductors were very friendly they would always wave as they went by!! We had a kind of revolving group. Saturday and Sunday it was me, Lindsey, Nick, my brother Tim and his kids Thaddeus and Heather. Nick went home Sunday night, Joe arrived on Monday. Heather had to leave on Wednesday, her mom came to pick her up, then Thursday Lindsey's friend Ashley came and spent the night with us. Like I said a revolving group! 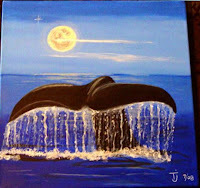 I did a lot of painting, here is my Whale's tail and Beach fairy. My nephew likes to paint with me, and both Lindsey and Heather did some painting too! 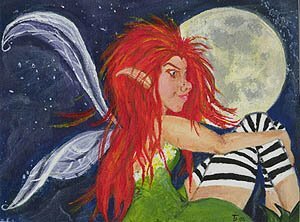 The beach fairy was inspired by Thaddeus. 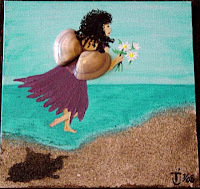 He found shells on the beach, and said to me Aunt Terry lets put the shells in the painting. This shell looked like wings to me! And I used real sand. Thaddeus painted a crab and used overturned shells for the eyes. He is very talented! We played some games, mostly spades. We went to the movies. We saw the new Batman movie, it was good. Lindsey, Ashley and I went to see Mama Mia! It was really fun!! We went into Santa Cruz and did some exploring and also went to Capitola. I had never been to Capitola before. What an interesting little beach town! The kitchen in the house we rented was wonderful! New stainless appliances and granite counters. We ate well while there, I just loved that kitchen! Oh and we went to the Monterey Bay Aquarium, and it was my very first time there! Wow! That is quite a place. My favorite parts were the sardines, and the jellyfish! And, well it was quite a place! Vacation was way too short of course. The weather was perfect the whole time. The only downer, I got sick while there. Still have the cough hanging on… just a little part of vacation that is staying around. All in all it was a great vacation, good family time. Looking forward to the next one! Be well, Tj. Hello all! Well we are back from vacation. It was a wonderful spot to spend a week. The weather was perfect, highs in the 70's, lows in well I don't know but it was never too cold. The sun was out most of the time, except for several mornings. So we get home and in the mail I have a blue ribbon! 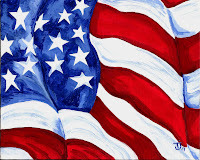 I painted a flag for my friend Patti last year, her husband is in the military and she love all things patriotic. 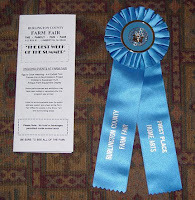 Well she entered it into the county fair where she lives and I got first place! WOW! I've never won any ribbons... ever. I didn't even know she was entering me. It was a really fun surprise! My love to you Patti, Thank you again!! Ok, well I have lots to share about vacation. Got lots of painting done, but I'll get back to that as soon as I can. Have many updates but we're going to eat dinner now. Be well... Tj.